Finally, Fringe has returned! And we can all blame the St. Louis Cardinals and Mother Nature for not allowing us to get our fix a week earlier. But, the wait was worth it folks. The episode lived up to its billing and Peter's return has just brought more questions with it than resolution, just as we suspected. And while a majority of the episode did focus on Peter's assimilation into this "slightly different" world, there wasn't a whole lot of time to rest as the 2.0 Shapeshifters are back! Well, let's dive right in folks, shall we? So novation (name of episode) deals with the substitution of one party in a contract with another party. I guess this their way of tying the themes of this week's case and Peter's return together. Smarter people than me could probably find more meaning behind it, but I'm just going to get right into recapping! 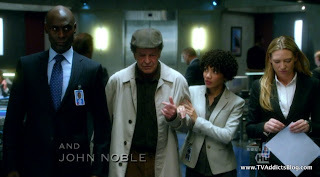 I know we really want to talk about the significance of Peter's return, but this shapeshifter stuff is clearly a major theme this season, so let's get that out of the way! 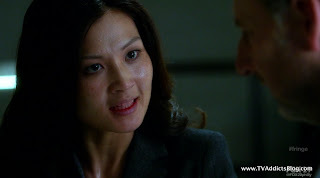 The lady shapeshifter that we saw at the end of the season premiere has returned and she's wreaking havoc at every turn. As we noticed in the premiere, there is something wrong with these new shifters. They're a bit translucent and this girl is on the hunt to fix her condition before it's too late. She was on a search for Dr. Malcolm Truss, a research scientist formerly under the employ of Massive Dynamic. She went to the house that was in his name to search for files. She took the appearance of Malcolm's wife, Karen, killing her in the process and tried to interrogate Malcolm for further information. What she didn't know is that Karen and Malcolm were separated so she ended up killing Karen's handyman boyfriend. Meanwhile, Dr. Truss was off the grid in Vermont, but the shifter makes her way there. Shifter lady meanwhile has abducted Truss and is filling his head with compliments. There are some mysterious people out there that think very highly of his work. They have the same vision his he did and want to pay him to continue his research. She tries to convince him by showing that she was a stage 4 melanoma patient but the cellular replication drove her disease into complete remission. The problem is that the procedure didn't fully take. The cancer is gone but she's still dying. The cancer story was most likely just a story to get Truss on board with helping and not this lady's REAL history. Olivia and Lincoln caught Broyles up on the situation. They explain the shifters are trying to repair themselves. Peter meanwhile has hot-wired the communication panel in his cell to listen in on the conversation. 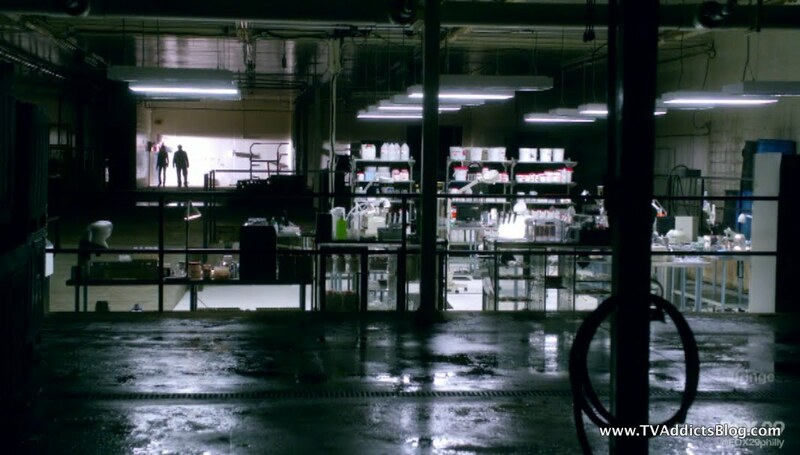 He had extensive knowledge with the 1.0 Shifters and their memory disks and there was a similar technology found in the shifters at the train yard in the season premiere. Peter offers his services to try and learn more about these shifters. Lincoln is actually the one that pushes to get Peter's help. Broyles wasn't too excited at first! Shifter Lady (going by Nadine) and Truss arrive at a gas station. Truss notices a picture of a girl in Nadine's wallet. She says it's her daughter Haley (is it though??). This opens up Truss to why he and his wife split up. She wanted children, he was too busy with work. And when he was let go from Massive Dynamic he just became angry and didn't want to make her happy. But he still has hope that they'll be together again. There's a small problem there Malcolm and you're gonna find out soon enough! 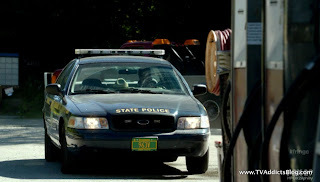 In the meantime, state police show up and identify Truss's car. But, we already know it's too late for that cop! He's a goner! Nadine does her thing, and she and Truss move on. She takes Truss to a warehouse with some pretty high-tech equipment provided by her mystery folks. Truss is falling for this hook, line and sinker. He is amazed at the skin grafts on Nadine and only wishes William Bell could be here to witness what his research achieved. Truss wanted to change the world for the better. Of course, as per usual, people found other reasons to use his technology. To create an army of human/machine hybrid shapeshifters! Truss found the source of the cellular degeneration and thinks he'll be able to fix it. 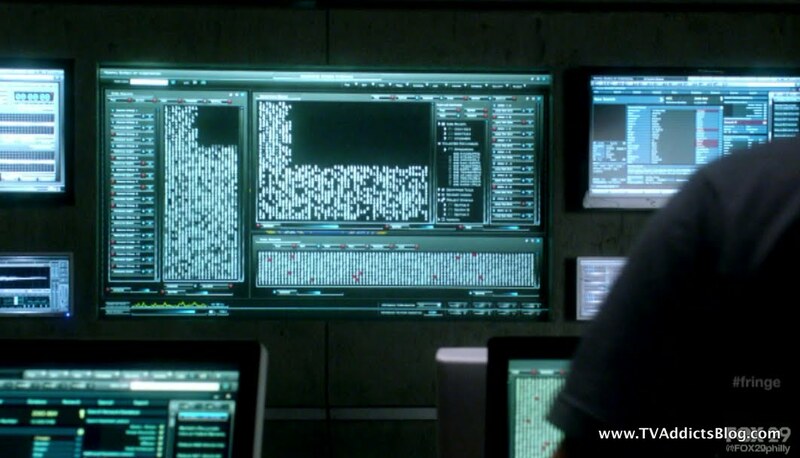 Meanwhile, Peter has discovered intel on the shifters. He discovered 6 completely distinct genetic profiles of the shifters on that memory disk. These shifters have the ability to BECOME the person they appear as all the way from their fingerprints right down to their DNA. They are indistinguishable from the actual person. And they can switch back and forth between any identity they've ever taken, unlike the 1.0 shifters who could only be one at a time. 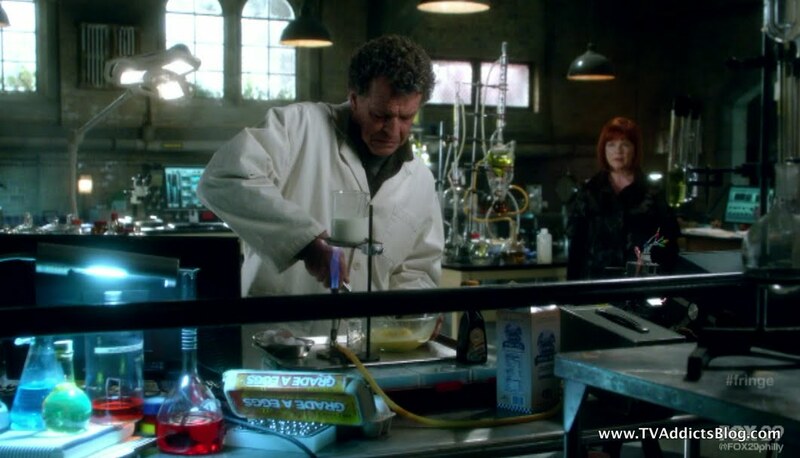 If they perfect the technology and get close to them, they could replace anyone on the Fringe team. I sense a little Battelstar Galactica 2.0 at work here! I guess we can assume Fringe Division is not infiltrated yet, but I guess it is very likely it could happen this season at some point. Or at least the threat will be there that it could happen. Stay Tuned. Truss came up with an attempted fix and gave it to Nadine, and that's when this story takes a little twist! Nadine is unable to control her shifts and shifts into Karen Truss. Oh boy, looks like someone lied to you Malcolm! Now Nadine/Shifter Lady is back to threatening Truss for help. Peter has found a signal being broadcasted from the memory disk and needs additional cpu power. 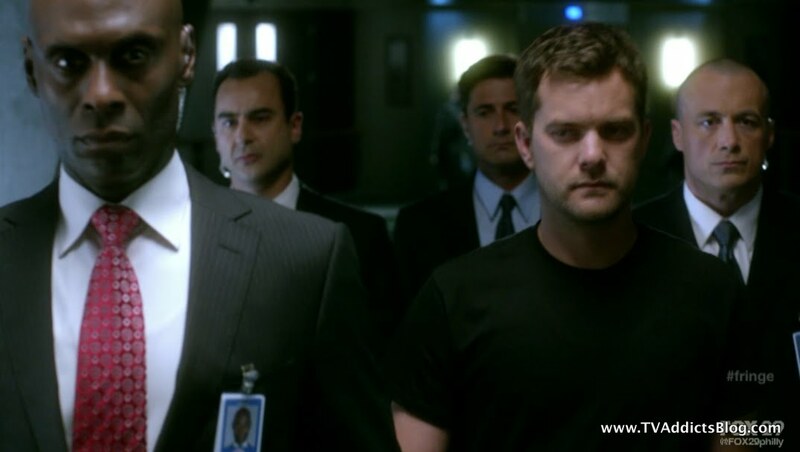 He convinces Broyles to get him out of the cell and onto the big machines! "Just like old times. Sort of." Peter figures out that these shifters all have tracking devices. The man/woman in charge wants to keep track of his agents. Peter was able to do some kind of techno babble to find the current coordinates of the shifter they're after. But, now they know someone is probably monitoring the network and will know someone has hacked the system. Olivia and Lincoln are dispatched to catch their shifter! The Shifter is trying to convince Malcolm to see the big picture. Great work created her and he needs to see his work to completion. 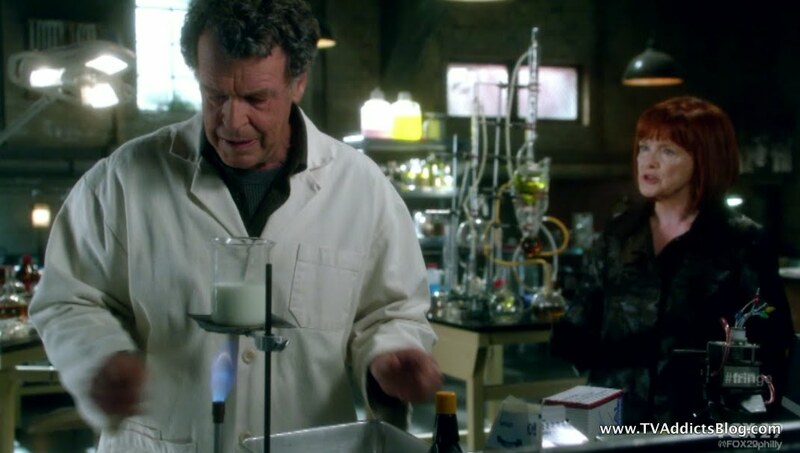 Malcolm is a little conflicted now and he tries to concoct some drug to kill her. But the shifter recognizes what he's doing right away and begins to threaten again. Truss has no choice but to finish what he started. The Fringe team arrives on the scene and the shifter goes into attack mode. She takes Truss's vial of the completed treatment and shoves him into the equipment. 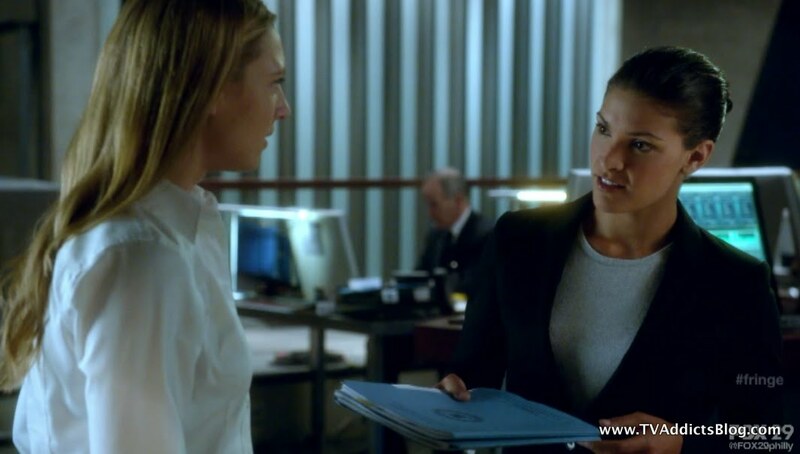 She runs to the roof taking out agents on her way, except Agent Warrick. I immediately thought that this was our shifter and it certainly turned out to be! She must've thrown the actual agent into the water after she shifted and they never would've noticed the difference. But now she is gone with her treatment and all. Truss finds out from Olivia that Karen died this morning. Truss blames himself for not listening to William Bell. "Some things are not ours to tamper with" He understands now. 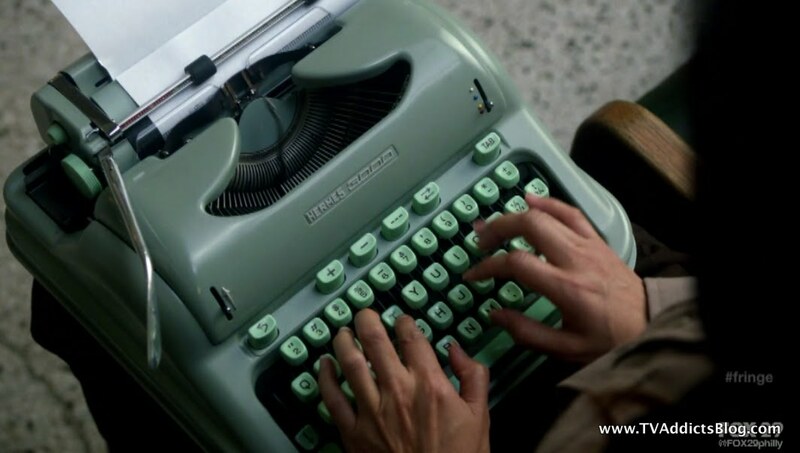 At the end we see Nadine take an injection of the treatment and then pull out some new fangled inter dimensional typewriter from a locker! The transmission: Doctor Truss Located. Serum Synthesized Successfully. It worked. The response: Understood. 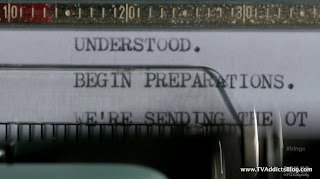 Begin Preparations. We're sending the others. Dum dum dummmmm!!!! So, who is the mysterious person behind these shifters? Some people might suggest Walternate since we still have not seen the man. And hey, maybe he is one of the people behind it. But, the cast and producers had been hinting at something since the beginning of the season. And, well, I'm afraid that some people might consider it too spoilerish. So, I'll just link to a certain article (SPOILER ALERT in ARTICLE) that might shed some light on the situation and I'll leave you with this. Think back to season 1 folks. Peter was highly involved in some of the major cases there and had he not been there, there's a chance some people may still be around and up to no good! Whatever way they decide to go, I'm pretty excited! Everyone is very confused by this mysterious man that has arrived with all of this knowledge of them. Peter is no fool and realizes that things are very different. And he knows the one man that can make sense of this is Walter. So he refuses to talk to anyone until Walter arrives. It's a bit of a Marty McFly/Doc Brown scenario where the 1955 Doc Brown has no knowledge of Marty but Marty has complete knowledge of what he's capable of and their friendship. Love it! Anyway, we don't quite get to that point in this episode. Walter and Peter start off on a rocky path. First off, I love the idea that even if we are in this new timeline forever, we still have one character that has knowledge of the 1st 3 seasons along with the audience. But, I'm not entirely convinced that this timeline is where the story will end. Walter starts going into a possible 3rd universe. A universe where Peter may not have died. They discovered one, why couldn't there be others? Walter talked about infinite universes in season 1. One alternate decision can start a chain of events that creates a different timeline. In this timeline, that key decision was with the Observer - September. 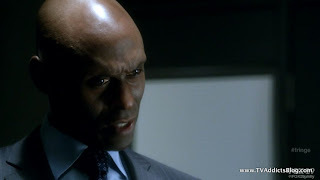 Broyles has a list of questions for Walter to ask Peter. Mainly about how he knows all of this classified information. Peter then asks if Walter had a son and he acknowledges he did but he died a long time ago. He also acknowledges bringing the other Peter over to this side to save him. But Walter says he could not save him because they fell through the ice and he drowned. Peter is surprised that the Observer wasn't there to save them this time. Walter has heard enough and runs out of the room, but Peter and the audience are just left with questions. 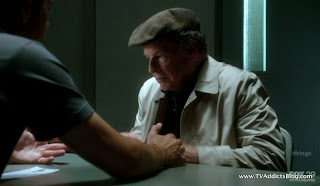 As Peter helps with the shapeshifter case, he does have a brief discussion with Olivia where he says he realizes he upset Walter. He was talking to the man he used to know, not this version of Walter. He wants another crack at it. 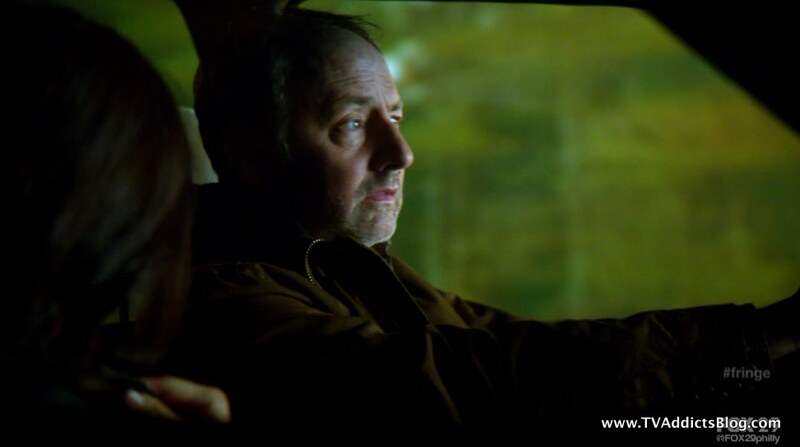 Meanwhile, we see Walter reliving his memories of his son Peter by looking in an old lunchbox of Peter's. 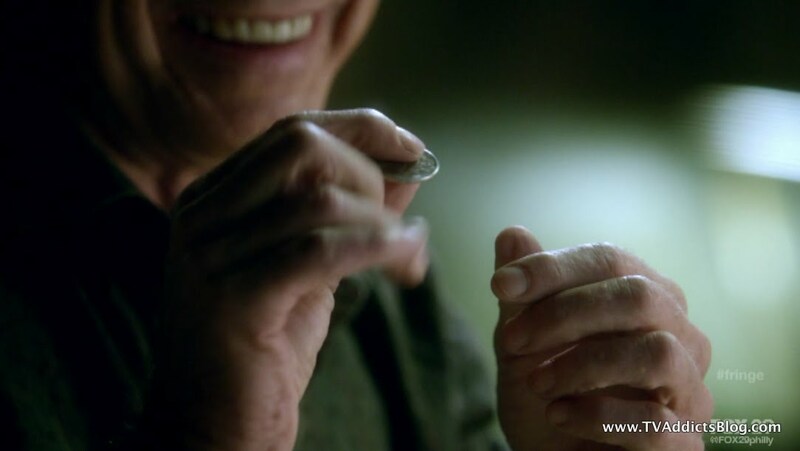 We see the return of the lucky quarter which has been in various episodes both flashbacks and present day. Nina shows up to talk about Peter with Walter as well. There is some friction between them (we're getting there) but she wants to put their issues in the past. For the sake of 1 life he destroyed 2 worlds and he feels now that he deserves to be punished. Walter says that he saw his boy in that man's face. He was filled with indescribable joy, but he doesn't deserve joy. He doesn't deserve to be rewarded. Nina tries to tell him that maybe he has suffered enough and this is a 2nd chance for him. Olivia discuss with Lincoln her issues with Peter being here. Why was he in her dreams? She slightly understands why he might have a connection to Walter, but why her? 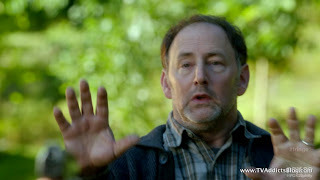 Walter does return to Peter at the end of the episode with a different attitude about him. Naturally, he asks if he's been fed which he has. Peter says he understands what Walter must be going through, but he doesn't know what to do. Olivia looks at him like he's a stranger and afraid of him. He knows what Walter is capable of and he needs his help. 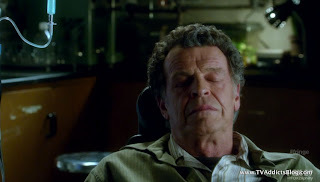 Walter grabs Peter's face saying he tried to wonder for 25 years what his son would look like as a man. But again, he starts going into how he doesn't deserve this. This is his punishment. He thinks Peter was sent to tempt him to see if he'd repeat the mistakes of the past. He cannot help him. And then he made the final blow. 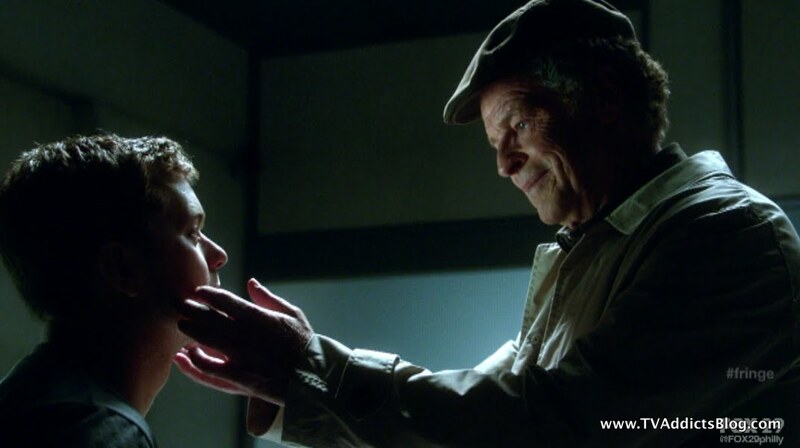 Walter says he tried to help a version of his son in the past, but that boy was never his son and neither is this Peter. It just breaks your heart doesn't it!?! And so we have the first steps of filling in that void in Walter's life, but we're not quite there yet. Definitely an awesome amount of tension, and I can see us being very frustrated this season. But, I think the payoff will be outstanding! I just hope the ratings get a little stronger or this could be the last crazy season we'll ever see! There is a brief flirtation between Olivia and Lincoln. She asks if he wants to get a bite to eat (she is obviously interested in him as we had seen the seeds planted in earlier episodes). Lincoln is too distraught with the shifter case and decides to go back to his hotel room. 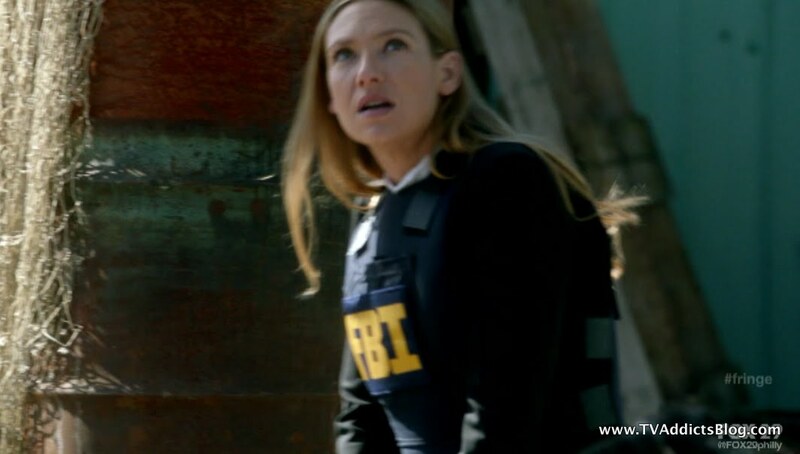 But the other weird thing that happened is when the agent brought numbers to Olivia and she thought they had already done that. It was a bit of a deja vu moment that was kind of like last week's episode. It would appear that even now that Peter is here, there are still some crazy time shifts going on in the universe. (minor spoiler alert) And it looks to be the focus of next week's episode. Perhaps these time shifts will lead us to the resolution of this "no one remembers Peter" event. Traces of Peter remained which was what was able to bring him back. All of this dimensional play is related to time in some sense. Different decisions, different timelines, different universes. It all is in the same playground. 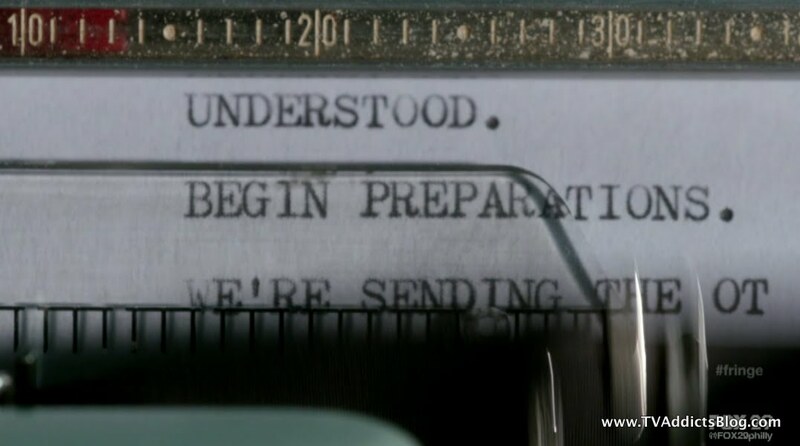 I'm sure a couple sentences from Walter in an upcoming episode will help us all out! Glyph Code: STILL - I have nothing on this one. Any thoughts? Thanks as always to Fringepedia for the great screenshots! Observer Spotted! - He's hanging out in the background at the house of Karen Truss when Olivia arrives for investigation. William Bell - The man whose scientific studies led him to cheat death and live on through soul magnets. His philosophy in this altered world was that some things are not ours to be tampered with, but God's alone? What made Bell think that way? I would guess that it would have to be a result of Peter dying when Walter brought him back over. Walter crossed worlds and created a deterioration 2 both worlds to accomplish what? Absolutely nothing! Peter died! This must've struck a chord with not only Walter but Bell himself. And William Bell is still dead in this world. What caused it? Did he die bringing Olivia back to this side? Or was it something different? Nina and Walter's relationship - It would seem that the history wasn't different here. Nina still tried to stop Walter from crossing to the other side. The vial with the cure still broke which meant Walter would have to bring Peter here. But Peter died this time. So Walter now blamed Nina for Peter dying. He eventually blamed himself but still continued to have anger towards Nina for being right. 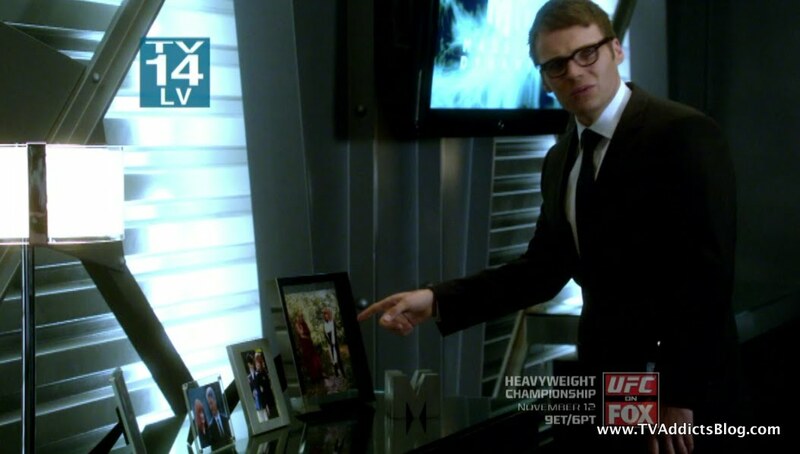 Because September, the observer, never interfered in the timeline, the Fringe division has never heard of The Observers. Astrid asks what an Observer is during Peter/Walter's 1st discussion. Olivia shrugged her shoulders. As we alluded to previously - Olivia and Nina have a much closer relationship. We find out that when Olivia's mother died, she and her sister were supposed to go into Foster Care (why? because Olivia killed her stepfather in this timeline! Why? I'm guessing because she never met Peter as a child and Walter didn't threaten the step father to chill out). So what happened? Nina pulled some strings and took in Olivia and her sister. Very interesting how one person's absence can cause such a difference in another's life. Food of the Week - Custard! Drugging himself to sleep and awake - Not exactly a Walterism, but it was pretty darn hysterical! 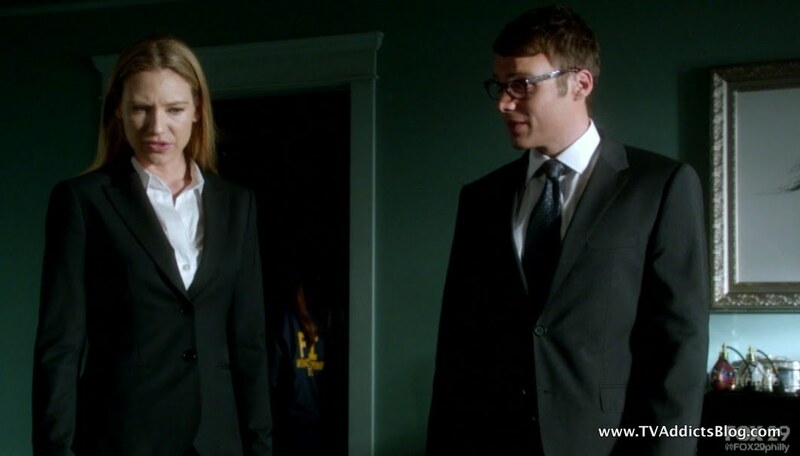 Olivia - "Walter, people from other universes just don't start haunting your dreams" Walter - "He asked for my theory! I didn't say it was flawless. So that's all I have this week. I think I got a little too "play by play" with my case recap but I didn't want to miss any key details there. As I mentioned, the shifter plot is a key plot this season as is figuring out what's going on with Peter! I'm totally into this season and can't wait for more! Unfortunately, though, I may not be able to do a timely recap next weekend. I will be out of town for the weekend. 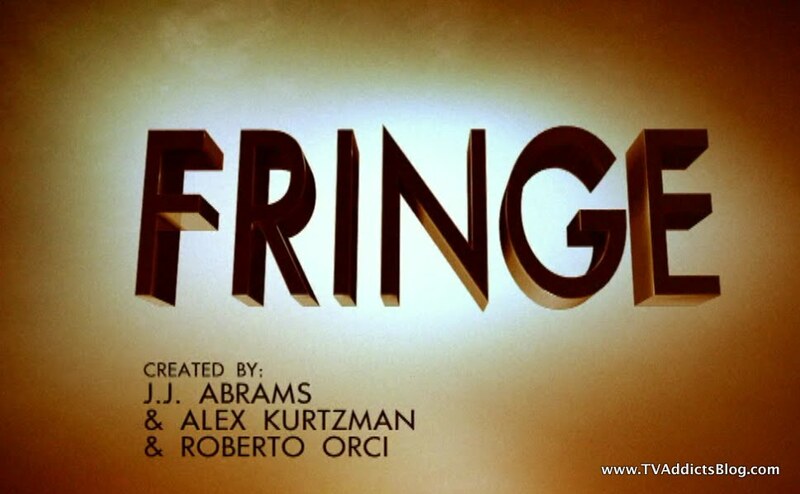 I'm most likely going to miss all 3 recaps NEXT WEEK: Fringe, Walking Dead and Terra Nova. But time permitting, when I return next week sometime I'll try to put up a quick post to discuss all 3 in one post. I apologize, but I did warn everyone that things were going to get a little crazy here with my pending first born's "birth" approaching! So, I hope everyone will understand! So until then, I hope you enjoyed my ramblings as always and I'll see you as soon as I can! As always great recap Mike. As a fan of this show I am very nervous with the direction it has taken. They are taking a huge risk by changing our characters. If they stay in this timeline then the first three seasons are less relevant, if they go back to the original timeline then the beginning of the season would be a waste. Lost Season 5 finale dilemma all over again! The acting this week was top notch and I thought Peter really stole the show. 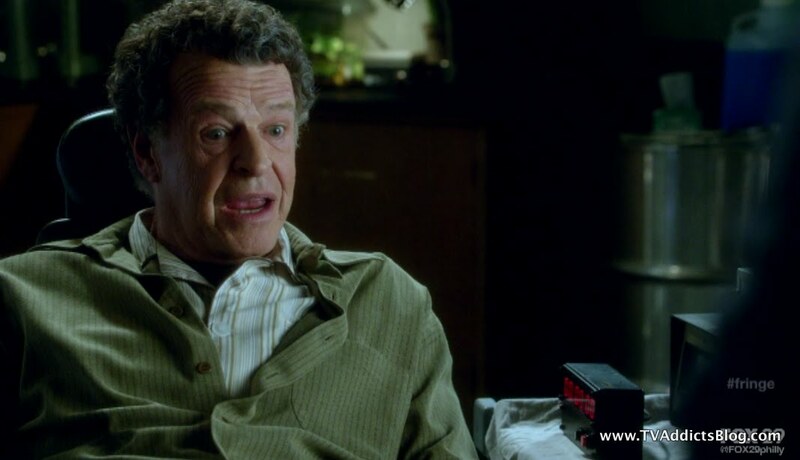 When Walter told him he's not his son you could see the devastation on his face. I'm hoping for a crazy twist like Jon Scott (from the first season) actually being one of these new shape-shifters the entire time of season 1. Thanks Deebo! I hear you on being nervous, but I just have faith in these guys to make sense of everything. They haven't strayed far from the overall theme of the show but yeah..in one way or another it would seem like we'll have some history of the show that is gone. Either this season's characters or the characters we knew from seasons 1-3. Then again, the memory of seasons 1-3 still loves on through Peter. But...I think they have something in mind other than Peter going back to his original timeline vs. just making due in this timeline. All of these time shifts and Peter constantly asking why no one remembers him makes me think it's something different. It certainly was the same discussions we had about season 5 of LOST, which is the reason why I knew they would never reboot the timeline! (and was vindicated in the end of course! lol) Fringe is a different show though, so you never know...but I think they'll find a way to make fans happy. They're telling a hopefully very long story and this is just one more chapter of it. (I just hope FOX factors other statistics into keeping this show around rather than just the live viewing ratings. They went up this week but Grimm still beat it. ugh. Totally agree with the acting being top notch. 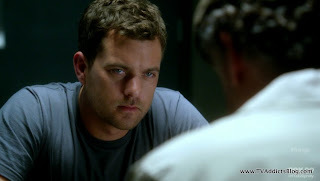 I thought Joshua Jackson was totally on his game. 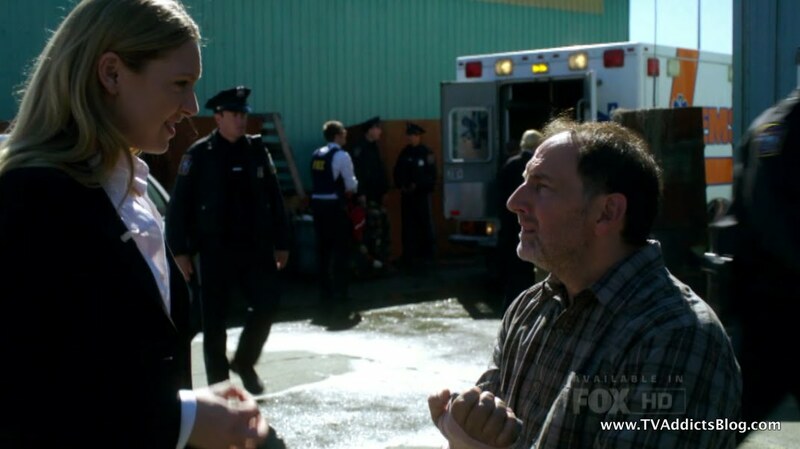 I loved the cocky attitude he brought too when helping with the case. He knew he had information that could help these people. He's their link they've been missing all of this time. Can't wait to see more of it. You never know with Jon Scott. I think we did learn in an episode this season that he still died the same way that he did in season 1. Peter's involvement/lack of involvement didn't change that. But as a shapeshifter, anything is probably fair game with these new breeds. Could be interesting! Thanks for the comments Deebo! Good recap Mike. I thought I may have missed a few points of interest because the show wasn't as revealing as I expected but after reading your review I guess I didn't miss too much. I was hoping that Peter and the rational Walter would get further in their discussions. If nothing else I figured Walter would be scientifically curious to map out the differences. But it makes sense from a series pacing point of view to draw that out a bit over several episodes. In reality they'd probably have gotten the basics fleshed out in a couple of meetings. I'm still a bit worried about these shape shifters being the primary focus because it means eventually there is a high probabiltiy that the main conflict will turn to an imposter. We have already lived through that storyline with Charlie (I think that was his name being a shapeshifter 1.0 model) and Olivia being replaced by Feauxlivia. Personally I don't enjoy those plot lines. I want new revelations and far out science fiction to be the focus, not spending time figuring out who is who and when will the characters realize that Broyles or Astrid or Olivia (a random character I chose here not a spoiler) is a shape shifter. In the end though, I guess I will just keep faith that the writers know what they are doing and ultimately I will be satisfied that I've just been taken on a great rollercoaster ride. So far they haven't let me down but I hope they don't get too bogged down on the whole double agent thing. Good point that we've already been down the shapeshifter road with Charlie. But in that case, WE knew Charlie was a shifter but the team did not. In this case, we may not know if a shifter has taken over one of them. I'm not sure if that's where it's going to go or not. I think the bigger deal will be who is behind the shifters. And I'm pretty excited about the possibility of who it is. But I don't want to spoil what I know lol. In the end, I agree. We must just keep the faith. They have told some great stories along the way and I don't think they're going to let us down now! Thanks for your commentary Bill! I'm loving the storyline so far. 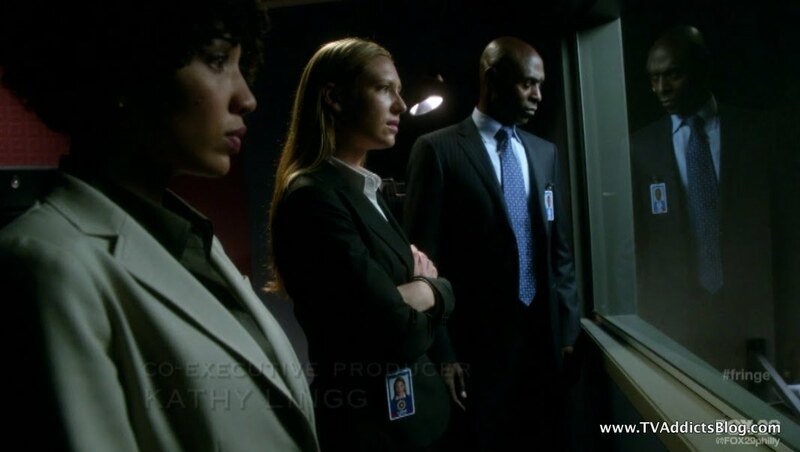 At first I was leary with fauxlivia, but it actually allowed us to see Olivia in a new light. See the pluses and minuses of each of those Olivias. It's really all about our circumstances and the decisions we make when we come upon those circumstances, as well as the ones we do not control. I have faith in this show and their writers. I know at some point we have to have our Fringe DIv start meeting their counterpoints - so far only Olivia has done that. Perhaps that is how they will trick us with at least 1 shapeshifter - they will get caught and pretend to be that person from the other side. 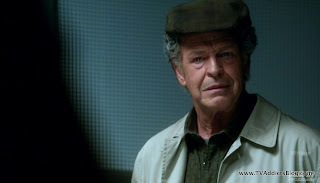 Can't remember if Kelly watches Fringe - but I can talk Revenge now. Very good ep last week. I'm caught up on Once as well - another great ep. I didn't think I'd enjoy this as well as I have. I'm enjoying Grimm - interesting enough and I don't need another show to try to keep all the deets in my head to keep track of it all. Have enough of those. 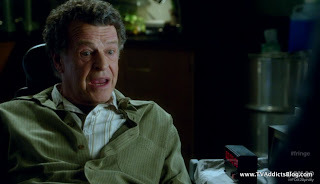 Totally agree with your comments on Fringe MJ! And good point about the other side and the dopplegangers. you know what? 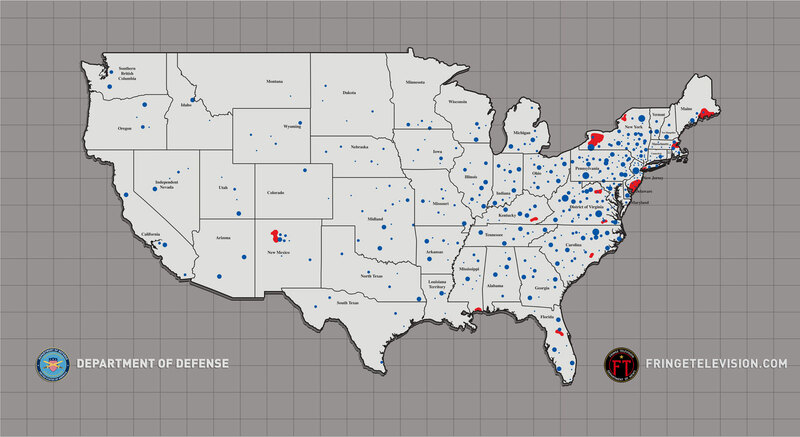 It would be interesting if they've already infiltrated over there. 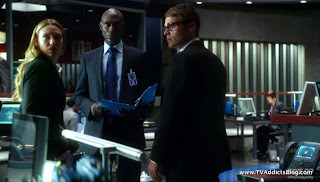 Maybe they already perfected the serum over there and Alterna-broyles is a shapeshifter since he's already dead in the original timeline. 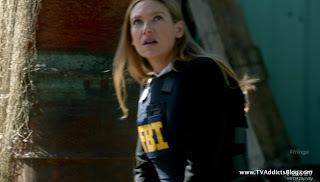 Of course, if things played out similarly to get Olivia back to this side in the new timeline...then Walternate would be fully aware that Broyles is not Broyles! Hmm...I'm already giving myself a headache trying to make sense of Shapeshifter decoys vs. original timeline and revised timeline. lol Things could get very messy if they're not careful! But I do have faith in these writers. I don't think Kelly does watch Fringe, but you never know! I'm still way behind on Revenge (aka..never started)...something tells me this might be a summer show or a never show for me! There's just no time. Grimm - I have fallen behind on this one. obviously only 2 episodes, so I just didn't see Fridays. Actually - Revenge would be a great summer watch - FYI. Yeah - with your trip you are going to be quite behind. Terra Nova def not on my priority list and is still on my DVR. You watch HIMYM ???? Awesome show last night. Fringe - meant to agree with you - I think we all saw the agent being the shifter a mile away. On my phone right now but just wanted to clarify that my priority was for the unwatched shows! I'm totally caught up on Soa! Lol watched AHS last night. Loved it! TN wouldn't be a priority for me if I wasn't recapping but I did enjoy this weeks! Definitely watched HIMYM - awesome episode. I thought there were still 2 slaps left before last night. But I'm glad they brought it back and found a new excuse to slap Barney a few more times! And now there's 2 slaps left. I'm guessing the final slap will happen in the series finale. Well, more I'm hoping! But now what's he gonna say on the next slap? For the first 4 he said "THAT's 1!, That's 2!" Now Lily's all "3 slaps remaining, 2 slaps remaining".... Maybe he'll slap him and say "and That's The end!" And the show just ends. lol Of course the Barney/Robin stuff was big too. Lots of people think this seals the deal of who will be the bride at the mystery wedding. I don't think that's a shoo-in just yet. 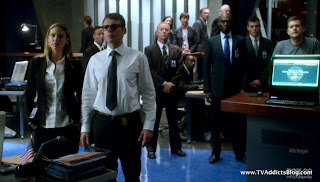 As for Fringe, yeah...it was no shocker that that agent on the roof was a shifter. I'm guessing that's what you meant! Thanks, Mike, for bringing this to my attention! Lol, it's funny that we don't remember where we put what, hahaha.. With your Lost and Flashforward recaps I feel like we kinda stuck to those shows. But now we're all over the place! Ah, Revenge- I'm trying to remember what happened! Oh yeah- I think Tyler and Nolan will probably start to form their own alliance, which will probably clash with Emily's little vendetta there. Think Lydia will remember what's up with Emily? Or will she have a convenient bout of selective amnesia? The real Emily coming to town throws a nice wrench in it, I wonder what's gonna happen with that. I liked how Declan told Emily how it is in front of the Graysons- stick up for us commoners, Declan! Let's see, what else happened? I'm drawing a blank. Oh, Mike- now that you saw AHS- so it looks like Tate really did shoot up his high school, not just fantasize about it like the pilot made us believe. And he's dead, too.. hmm.. And am I the only one that loves that gay couple? They should be on every week! I love the love/hate thing they have going on. Yeah, it's the one downside to a blog that encompasses multiple shows and prides itself in discussing ALL television! There's no order to it! I should've just started a message board at this rate! lol But I think we're getting by okay. I'll skip the Revenge stuff since I haven't watched yet! Right, my wife had to remind me that he talked about the high school shooting dream in the pilot. I totally forgot. 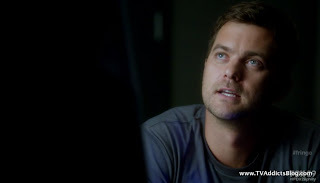 But it's interesting that Tate may not realize he's dead and doesn't remember the shootings. I wonder if Jessica Lange's character had anything to do with brainwashing him or something. (how do you brainwash a ghost?? Or maybe it's something like LOST's Flash Sideways where they don't realize they're dead right away) Oh god...Zachary Quinto (Sylar from Heroes/Spock from Star Trek Reboot) was fantastic in AHS. I do wish he would be on every week. He supposedly will be returning at some point according to Murphy. The thing about Damon and Carlton, I knew they weren't going to answer much when I listened to podcasts, read interviews, etc... But I knew they would sometimes tell me what I'm wasting my time thinking about or if we're asking the right questions and stuff like that. And they were just an entertaining duo to read/listen to. I miss those guys. Thankfully I get to see them talk about random stuff on Twitter all of the time. lol Ryan Murphy - I cannot believe this is the same guy that is responsible for Glee. lol I know he did Nip/Tuck beforehand but talk about 2 different extremes! I just hope he doesn't have a season 2 blunder with AHS like he did Glee. Or later seasons of Nip/Tuck (never watched...just heard about it) But I'll give him the benefit of the doubt because the show is awesome right now! Well - you might be able to work on Shanna since I think VD (we need a new abbreciation for that one) is done until January after this week. HIMYM - I always thought the last slap would be int he finale too - but now they are showing a willingness to add slaps I am happy. Yeah - i still am of the belief that they are not together in the end. Red herrings and all. But I enjoyed the kiss, though he's going to meet Nora's parents. Loved the whole duck tie thing too. I've been really tickled that he's kept wearing it. SOA Oh - before I forget - Tara put the original letters in a storage locker. I'm too lazy to go back to TWS where we are talking SOA. Sorry. Another great ep. Agree on Tyler and Nolan aligning. We all knew Tyler was up to no good - just didn't quite see that coming. Emily could use a few set backs, if it't too easy each week then it could get dull. I'm shocked by the whole real Emily part ! And what could new Emily have over old Emily that she'd just kill Frank for her !?! COlor me intrigued. I also loave the gay couple. Odd coincidence that the actor came out of the closet just a few weeks ago though. I had chills when I realized that the killing at the school was actually real, but that Take does not seem to realize. Wonder why Constance wants to keeps his sister's death from him. I can totally see that this guy did Nip/Tuck. N/T was great in early years. But was so outrageous and shocking that they went way over the top trying to one-up themselves to the suffering of story. Hopefully won't be repeated. Oh come on MJ...everyone knows it's TVD!! lol (THE Vampire Diaries) Good point that it's on hiatus until January after this week. Maybe I'll mention that. I'd so rather watch some Community and Parks and Rec!! Nuh-uh ! It's VD. LOL. Robin's boyfriend actuallye ven fit into the group better this week. Tv has really had a good season so far this year - I know Kelly said that elsewhere but forgot to agree with you Kelly. AHS, Revenge and Ringers have all pleasantly surprised me, as has 2 Broke Girls and New Girl. Cannot wait for Awake, Alcatraz - and that Keifer Sutherland one who's name is eluding me at this time. Still not watched Homeland - but I have them all and will probably do so on the hiatus between the holidays. And old faves have really hit their stride and improved even. 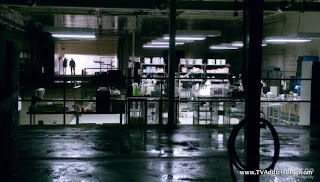 Dexter, SOA, Fringe, Chuck and others. Oh - and it was so nice to see Jax be able to just relax on their road trip, sing with the kids, etc. And after some initial discomfort he was evena ble to talk with that cop and feel at ease. If I have this right - and it's possible I don't - Jax and the crew sorta think Lobo is responsible for trying to take Tara and we all know that Romeo (cartel) really hired the hitman for Clay. But I kinda got a feeling that Romeo never inteded a hit but always wanted to kidnap her. Is that just me ? 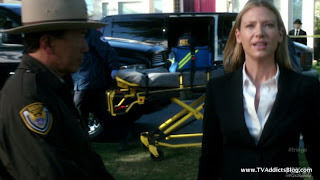 MJ - not sure on the SOA thought of Tara being kidnapped. But Sutter did mention that he didn't want to do another "tara kidnapping" story because they had already done that. So I dunno??? The SOA discussion was still on the Terra Nova post if you're looking for it. But I saw that there were a few comments so I'm looking there next. BTW...I'm leaving for my trip soon so I won't be on here as often. I'm going to post a "HIATUS BLOG POST" where you guys can discuss whatever in the meantime! Have fun! Have a good trip Mike ! We;ll keep the blog warm for you.